Our RUGDEALER loved the idea of making dresses out of actual Persian carpets and put on his fashion designer cap in 2003 to design some awe-inspiring dresses showcased at the Design Quarter Shopping Centre opening. For his brave creativity our RUGDEALER earns top spot in our Top 5! Hermès has had a long love affair with Persian carpet designs and for their flair in showing it, they earn second place in our Top 5. 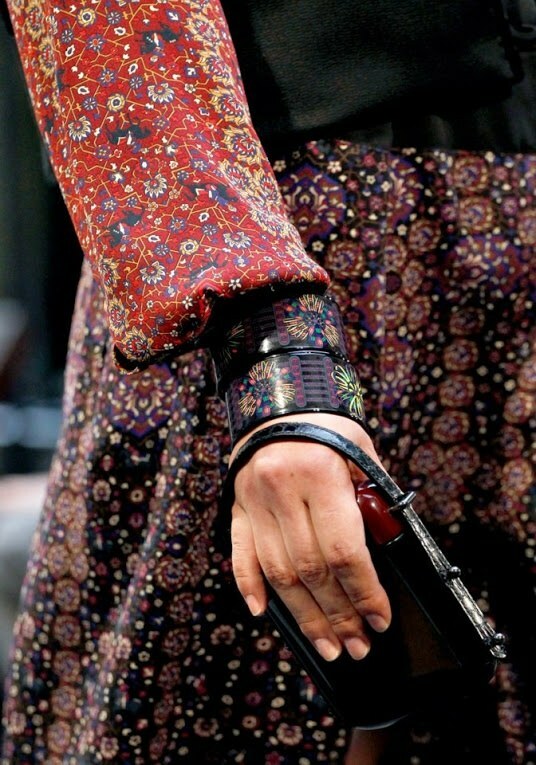 In 2013 Hermes released a new collection named the Tabriz collection at their New York fashion week show, the collection was inspired by the heritage of Tabriz rugs. This wasn’t the first time that Hermes had taken inspiration from rugs, Cathrine Baschet had previously used designs in a Hermes silk scarf named Qalamdan. 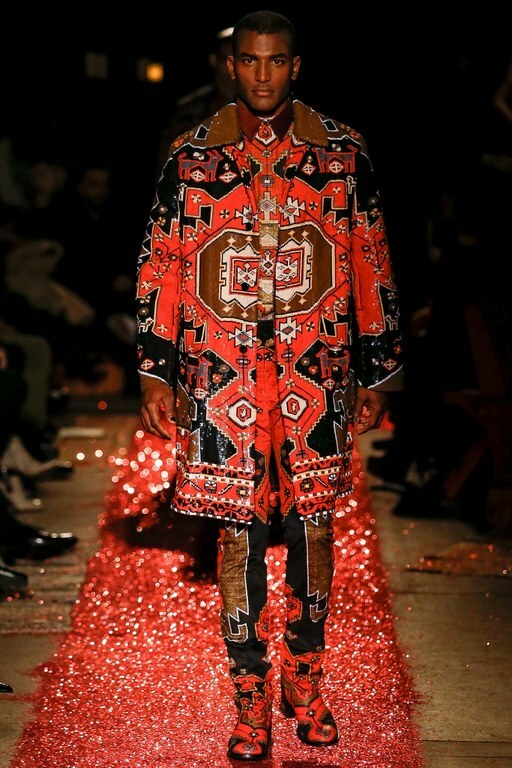 Riccardo Tisci presented a great men collection, somewhere between darkness and warm persian carpets for Givenchy’s next fall-winter. A large proposition of Persian carpets and its iconic patterns attacked the runaway. Sometimes subtly, sometimes in a colorful all over look. 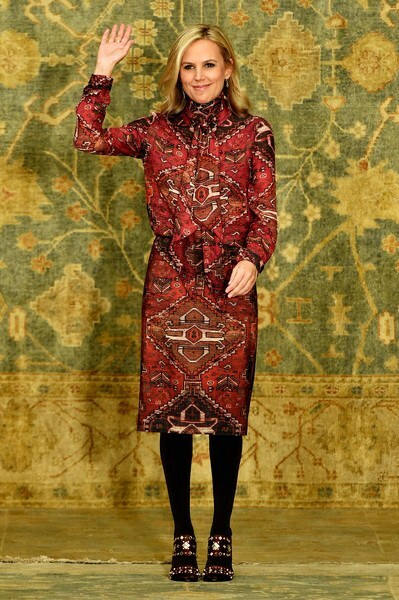 For their beautiful and bold use of Persian carpet designs, Givenchy earns spot no. 3 in our Top 5 list. Rich tapestry was the focal point of the entire Tory-Burch fall/winter 2015-2016 collection, which comes combined with studs, sequins and tassels to embody the colorful Marrakech culture. For paying homage to the vibrancy of an ancient culture Tory Burch earns spot no. 4 on our Top 5 list. 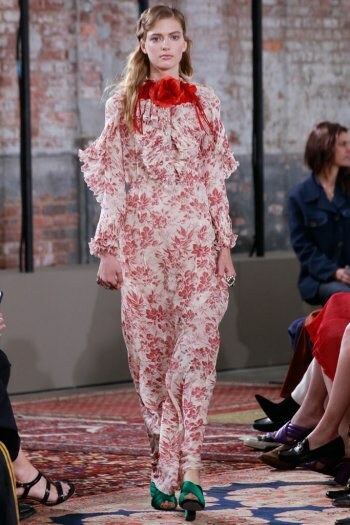 With crumbling brickwork and antique Persian rugs piled on the floor end to end, Alessandro Michele made the show space in Chelsea look like something out of a Wes Anderson movie, and it was a million miles away from a Milanese milieu. Obviously, you don’t ascend to the role of Creative Director at Gucci without a discerning eye. The “knife-pleated lace skirts,” “faded pastel shades,” and “long-sleeved evening dresses that tumbled to the floor” looked absolutely stunning on the classic patterned rugs. Although fashion houses are often known for eschewing the old for the new, the choice of decor belied a stylistic throwback to another time. The earliest Persian carpets date all the way back to 500 BC setting a classic tone for the thoroughly modern event. For marrying the ancient with the brand new Gucci earns spot no. 5 in our Top 5 list.